Alt Balaji has carved a niche for itself with cutting edge original content. 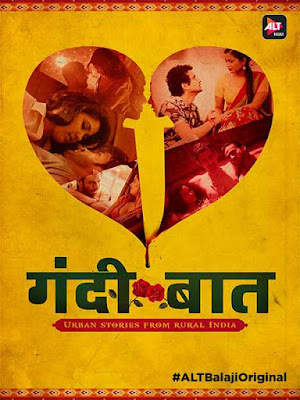 Its diverse library ranges from urban love stories, discussing LGBT issues, talking about India’s biggest cover-up, to a show that sparked off debates and discussions on women empowerment and role of women in Indian armed forces. When Gandii Baat – Urban Stories (based on true rumours) From Rural India an #ALTBalajiOriginal launched in May, it soon became a massive hit, garnering unprecedented views within a day of its launch. Now, the makers are coming up with the second season of the show which will be based on stories of women sexuality and empowerment. It will be extensively shot in the vibrant landscapes of Rajasthan . The cast and final date of the show will soon be announced soon. ALTBalaji is India’s largest platform for original and exclusive digital content with more than 15 million mobile plus web users and is available in over 90 countries. The digital platform currently offers 23 original shows in Indian languages across various genres such as romance, mystery, drama, and comedy. The platform also offers entertaining original shows for kids and have launched short, hilarious regional stand-up comedy videos in Marathi, Punjabi, Hindi, Gujarati, Tamil, and Telugu.